Classed as one of the largest fireworks displays in South, not only is there a spectacular display on offer, but also plenty of attractions and live entertainment on offer before the main event. The theme of this year’s event is “Back to the 80’s”. There will be the old-fashioned fairground with old classic games and rides on offer such as: coconut shy’s, a big wheel and the classic carousel with extravagant horses and even a fancy-dress competition; so drag out your 80’s shell suit, find out your clothes with the biggest shoulder pads or dress up as your favourite 80’s music or tv personality. During the day you can visit the Beaulieu attractions which are open from 10am as normal. Why not make a day with all the family and take a walk around the serene grounds and gardens that surround the palace house, take a ride on the mono rail or open top veteran bus, walk in the footsteps of a thousand monks and view the history of Beaulieu Abbey, wonder around the national motor museum or if you’re a bit of a petrol head take a trip into the world of top gear and see some of the iconic cars from the challenges in the programme and take a seat in the famous BBC Top Gear studio. (please note the world of top gear closes at 3pm). If you want to turn up just for the experience of the 80’s then the gates for this and the fireworks will not open until 3pm. Make sure you are ready to celebrate a decade of memorable music, film, technology as well as the groovy fashion. On stage there will be the wave 105 radio presenters ready to get the evening off to a start with live entertainment both before and after the fireworks. Along with this and the fairground there will be various stalls selling hot and cold food and drinks both inside and outside. Treat yourself to candy floss and hot roast chestnuts, burgers just to name a few of the things on offer. Please note that you cannot bring any sparklers, folding chairs or seats with you due onto the site with you. It is advised to bring a torch as this may be needed In places. The main event of the fireworks begins at 7:30pm with the full 30 to 40-minute show of pyro musical delight. Watch the skies over new forest light up in array of colours and effects all perfectly times to some of the most iconic 80’s hits. With something for all the family and plenty to see and do make sure that you put this event in your diaries. The following video footage was sent to us by one of our customers; David Ireland. The video was shot in Blackpool during an Epic Fireworks display for his family and friends. Filmed on a DJI PHANTOM 4 Drone, which in the world of helicopter drones is billed as DJI’s smartest flying camera ever. Quite the bold statement but given the quality of the footage, there is not much room for doubt. Capturing the very essence of the fireworks, the footage is not in amongst the display so no chance of spoiling it for the spectators but gives a fantastic eagle-eyed view (or as it is clearly dark, perhaps a bat’s view!) of the display and the colours seem ever more vibrant. The display was for family and friends and it is lovely to see the colours and effects of our products from a sky view over this iconic West Coast town. The UK festival of fireworks is held annually and is organized by Jubilee fireworks. 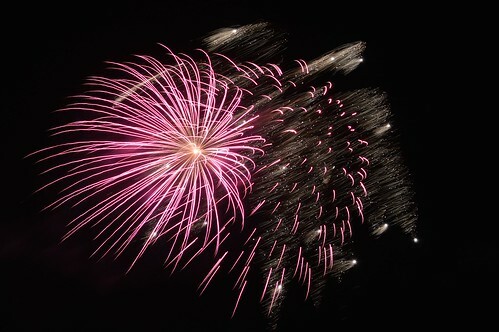 Catton Hall is the venue for what is known as the UK’s largest fireworks extravaganza. Witness the skies dark blank canvas set alight as 4 different companies on the fireworks industry put on their own musical pyrotechnic displays with something for all the family to enjoy. The festival offers the opportunity to experience some fantastic and out of this world examples of firework art. Normally, in competition, the teams are bound by certain rules to what they can and can’t do but in the UK fireworks festival, each of the display companies are free to show off their own design talents in any matter that they choose, making this festival unique and one of a kind every year. The gates to the festival open from 12pm with the main displays starting from 8pm onwards. We advise to turn up early to get your prime viewing spot and get set up for the evening ahead. You can bring along your own little afternoon tea or picnics or if you would like something different you can choose to sample some of the wide range of food and drink down at the food fair. Catton Hall, however, does not accept or allow any pets, BBQs, garden flares, ball games or any personal fireworks on the site (this includes sparklers I’m afraid). But there is plenty on offer to eat and drink and do at the festival itself for you not to need these items. Last years event saw the introduction of the steam rally, a collection of full size and miniature vintage steam engines and vehicles for any enthusiasts out there, and we believe this is the same this year. With the mission statement for the company been “making people happy with fireworks” you know that the young and dynamic company run by husband and wife team are going to put on a jaw-dropping performance. The company has entertained on both small and large scales and some of the lists of clients include Wembley Park, Flamingo Land, Alexandra’s Palace and Yorkshire Wildlife Park. Using the most up to date systems of firing the company ensures that the shows they put on are the cutting edge on design and modern pyrotechnics. With over 30 years’ experience in the business, Fully Fused fireworks is an event management company that excels in the production as well as management on all events they range from parties and weddings to indoor and outdoor concerts. The company and its owner have a glittering cv and some good awards under their belts much as a winning show in Monaco (Monte Carlo) as well as winning many other international firework competitions. Known as a well-established supplier of consumer fireworks as well as doing professional displays the team at 1st galaxy have an abundance of experience and have staged some impressive displays not only for the normal public events like bonfire night, Christmas light switch on, new years eve and summer festivals the company has also taken part in “Festival D’Art Pyrotechnique” in Cannes. As well as doing the displays the company also sells their own exclusive fireworks under the brand “Britannia fireworks” they also sell other brands such as Vulcan and Jorge from both Europe and China. Not only are they the company organising the event they are also taking part in the festival as well. The company was formed in 1987 and through the years has now been transformed into becoming a major force in the UK fireworks industry and have a powerful reputation internationally. They have gained the champion of champions in both musical and traditions national competitions also received some winning medals for international competitions in Manila (Philippines) and Knokke Heist (Belgium). In 2015 the company won the golden Jupiter award in Le International Des Feux Loto Quebec in Montreal Canada adding one of the highest accolades to the trophy cabinet. With all the companies having a win to their name, the event getting 5-star reviews on last year’s festival you know for definite that you are in for an action-packed, breath-taking, amazing evening.